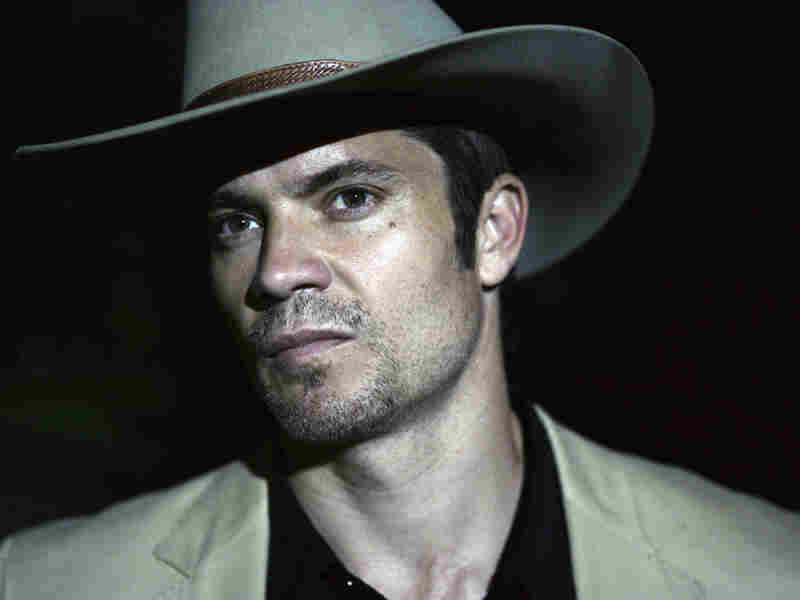 Timothy Olyphant: 'Justified' In Laying Down The Law Actor Timothy Olyphant stars in the FX series Justified as Deputy U.S. Marshal Raylan Givens, a present-day lawman with Wild West instincts. Olyphant also starred in HBO's Deadwood as sheriff Seth Bullock. Timothy Olyphant plays Deputy U.S. Marshal Raylan Givens on the FX series Justified. In last year's opening episode, Givens was based in Miami. But after forcing a drug dealer into a showdown — and then shooting him — the loose-cannon lawman was transferred back to his backwoods Kentucky hometown, where his job puts him on the trail of childhood friends who are now on the other side of the law. "The thing that's very attractive about the character is the moral code of it all," Olyphant tells Fresh Air's Terry Gross. "I always go back to that scene in the first episode, where Raylan told a guy that you don't walk into someone's house unless you're invited — and at the same time, he gave somebody 24 hours to get out of town or he'd kill him. That to me says everything you'd need to know about the guy." Olyphant also starred in the HBO series Deadwood as Western sheriff Seth Bullock. His film credits include Gone in 60 Seconds, The Broken Hearts Club and A Life Less Ordinary. Timothy Olyphant plays a U.S. marshal who gets transferred back to his Kentucky hometown after outdrawing and killing a bad guy in Miami. The odds against Timothy Olyphant's finding another TV role even close to matching the quirkiness and intensity of the one he played on HBO's Deadwood were pretty high. After all, David Milch's Deadwood was a weird, Westernized mixture of Shakespeare and "Rocky Raccoon." It was one of the best TV shows of the past decade, with literally dozens of fabulous characters and actors — and Olyphant's reluctant sheriff, a quiet man with a very short fuse, was one of its biggest standouts. Yet here the actor comes again. In Justified, a new FX series that premieres tonight (10:00 EDT), Olyphant intentionally — and successfully — flirts with his own TV past. 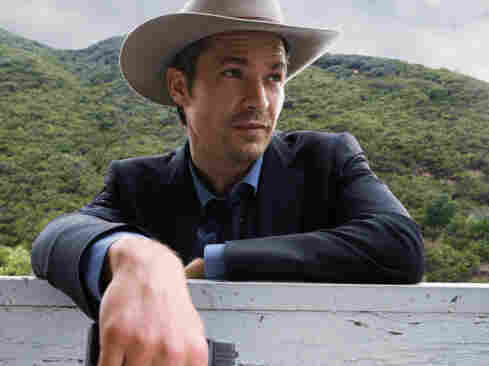 His new character, Raylan Givens, is a present-day U.S. marshal, but he's Wild Wild West all the way. He's a fast draw and an expert shot. He wears a Stetson — maybe the first TV cop since Dennis Weaver's McCloud to get away with that. And after outdrawing and killing one bad guy, Raylan is transferred from the sunny skies of Miami — home of Burn Notice and Miami Vice — to his former home in the backwoods of Kentucky. "From gold mines to coal mines," the territory is filled with delightful oddballs. Justified isn't quite in the league of Deadwood — very little is — but it pulls off that same tricky balancing act of mixing tense drama and low-key comedy, often in the same scene. And it's no wonder: Justified is based on stories by writer Elmore Leonard, who also inspired the movies Get Shorty and Out of Sight and the snappy, short-lived TV series Karen Sisco and Maximum Bob. Every TV lawman who's as much of a loose cannon as Raylan has a boss whose job is to try to rein him in. Usually, they're written and played as either hypertense shouters or anguished mumblers. But Nick Searcy, as Raylan's old friend and new captain, has a different approach: sarcasm. In Episode 2, Searcy confronts Raylan about yet another shooting that, to borrow from the show's title, Raylan claims was justified. "Put it like this," Searcy says: "If you was in the first grade and you bit somebody every week, they'd start to think of you as a biter." Eight years ago, the FX network made its reputation with The Shield, and one of that show's key players, Walton Goggins, is featured in Justified, too. In The Shield he played Shane. Here he plays an old friend of Raylan's who has wound up on the other side of the law — but who, like Raylan, hasn't lost any of his swagger or his sense of humor. They're lots of fun to watch — and, in no small part because of them, so is Justified.